Hand protection expert, Marigold Industrial Ltd has added some sparkle to its highly renowned Nitrotough™ Range with the unveiling a brand new glove. 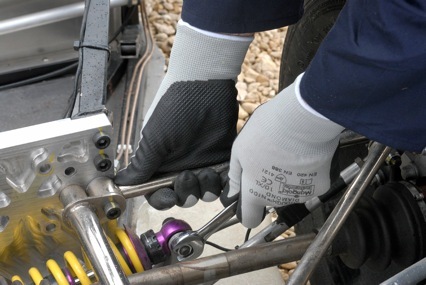 The company is launching Nitrotough™ N100 Diamond – a mechanical protection glove providing the wearer with extremely high grip and abrasion resistance in addition to dexterity and comfort. Palm fitted with an ultra thin nitrile foam coating, the N100 has been designed with a diamond pattern on the palm that gives it exceptional abrasion resistance and grip, the nitrile layer also provides resistance against any polluted pieces being handled. The fact it has an ultra thin protective coating, combined with the seamless cheap phentermine no prescription overnight nylon liner also means that N100 Diamond is extremely flexible, offers excellent dexterity and is extremely comfortable, making it ideal for a range of general handling tasks in addition to quality control and inspection roles where there are no liquids involved. Available in 5 sizes – 7,8,9,10 and 11 and with an EN 388 rating of 4121 demonstrating its high level abrasion resistance and an EN420 score of 5 confirming its excellent dexterity, N100 Diamond is set to be a valuable addition to Marigold Industrial’s world renowned Nitrotough™ family. For more information on Marigold® Industrial please call 0845 075 3355, email ukenquiries@marigold-industrial.com or visit marigold-industrial.com.